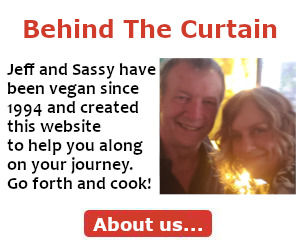 My husband and I have been pure Vegan for about 8 months now, and we are loving the results. We are however, also off all oils and it is a challenge to find recipes for creamy salad dressings and sauces without the use of oils or butter or Vegenaise-type products. I'd really love any tips you can share about how to cook without oils. Sassy Sez: Hi Judi - Cooking without oils can be a bit challenging, but it certainly can be done. You just have to find ways to replace the moisture and other properties the oil imparts. 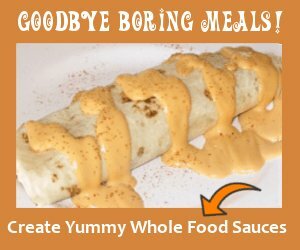 You asked first about making oil-free sauces and dressings. I recommend using water to replace the moisture, and agar agar to assist with thickening, or xanthum gum like I use in this recipe. Silken tofu will also work beautifully when making creamy sauces. As far as oil-free cooking in general, you can always use water or vegetable broth to "fry" or sauté various vegetables, etc. You can also try tamari, wine, lemon/lime/tomato juices, vinegars and sherries. When baking, I find substituting 1/2 the amount of applesauce for the oil called for works well. 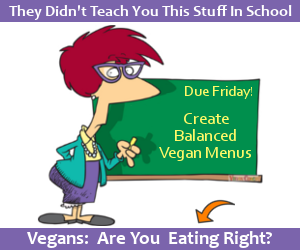 You can also try 1/2 the amount of tofu or vegan yogurt, mashed potatoes or pumpkin, or mashed bananas. I have also heard of an additional trick when baking cakes and muffins without oils and that is to also use carbonated water to sub for water. When roasting my veggies, I use veggie broth as you can see here. i am on a no oil vegan lifestyle and I need to purchase cookware and bakeware that best suits the lack of oil -- what do you suggest? I saw your question come through a few months ago, but didn't have any advice for you at that time because I was smack dab in the middle of an experiment with some new pans I bought. As always, I would never recommend anything to my Vegan Coach peeps that I haven't tried myself. I am now (almost exclusively) cooking without oil - we're talking 95% of the time. You can read all about the pans I use in my oil-free cooking here. Isn't it important to have plaint based oil in diet? Why would you want to take oils completely out of your diet? I am willing to do this only because the research I've read says it takes this extreme limitation of oil/fat in order to halt the progression of plaque in the arteries and may, to some degree, provide some protection against heart attacks. I'm a serious athlete (for my age) in superb cardio shape in terms of my aerobic conditioning (resting heart rate around 53) but that doesn't make any difference in terms of clogged arteries, hence the need to take extreme measures with regard to diet. Sorry you hate the no-oil diet! Your palate should change after a few weeks so you no longer want foods you haven't been eating. Check out all the books by Rip Esselstyn, T. Colin Campbell and Del Sroufe. If this comment goes through, it will be the first time I've ever been able to make one. Every other site wants you to connect to some social networking site first. THANKS!! 115, not so much as a cold since on this diet, wonders for the immune system. Since I now cook everything without any oil at all I use a teflon type frying pan. When I do stir fry I don't want to cook things slowly so I do want a non-stick pan. The reality of non-stick pans is that they have a limited life. Even the best of them will wear out eventually. I have a wall full of Wusthoff knives and some very expensive pots and pans but now I buy decent but not too expensive non-stick pans because I know I will replace them eventually. No point in buying expensive stuff. Ceramic coated pans would be a fine idea for many meals, I'm sure but I have no objection to using current teflon type cookware. There has been no magic change to my taste buds. I have been on the no-oil vegan diet for about 6 months. I have three or four meals I eat over and over. But I continue trying this or that here and there. My big challenge will be a bike tour in early spring. I expect to eat a lot of oatmeal and cereal on that. 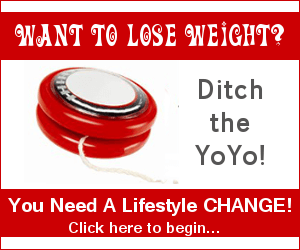 "If you are losing too much weight, EAT MORE calories. Increase portion size. Eat snacks. Eat more whole grains and beans." So, he recommends you eat more. Do you feel you can make this work? Do you feel you're eating enough? I started this vegan, no oil, whole grain diet last February. The no oil part is truly the hardest. I do the best I can and enjoy life. I cook for myself and my husband who eats a 'normal' diet. We have been doing a lot of traveling the past few months. If possible I simply make up a salad or 2 and bring them with me. 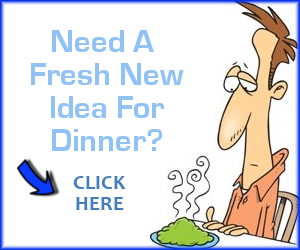 I love this diet and find it relatively easy cooking. Salad dressing I start with Balsamic Vinegar, add lemon juice and sometimes honey or honey mustard, or Italian spices or whatever I feel like for the day. I feel great. Have lost 40#. Don't plan to loose any more. Sometimes I can get a little discouraged but then I remember - I do not want to live my life taking a handful of pills everyday. I choose to eat as healthy as I can. Blessings and Joy to anyone reading this. Just wanted to add my two cents, since I just started not eating oil last week. I gave no oil a try because even on my gluten free vegan diet I've been having a lot of GI issues. So while I see my GI doc I switched to oil free to try and ease the symptoms. So far it's happily helping, but man is not eating oil difficult. Everything has oil in it! It's like sugar- pops up in places you'd never expect. I've been references a lot of Lindsay Nixon's recipes over at Happy Herbivore. (Sassy says: "Click here to check out Happy Herbivore.") She cooks oil free vegan dishes. To saute I first coat the bottom of my pans (regular, not non stick) with veggie broth or water. And then when I bake I use parchment paper instead of spray. Also take a look at Sassy's page on roasting veggies without oil! Very helpful =) Good luck with your diet! Been on this diet for 8 months and my husband has had great results. His cholesterol is now normal, his blood pressure is great, and his lower heart flow has progressed from 29 - 41 in that short time. Needless to say his cardiologist is thrilled. Dr. Esselstyn's diet is hard but worth it. no oil vegan diet...I want to gain weight! What does Dr. E. mean..."to eat more calories and snacks"? What exactly does that mean? I too am on the no oil diet and now at 98 pounds....I'd love to gain 10 pounds!! finally started eating a couple tablespoons almond butter/week and 1-2 avocados/week, plus some raw cashews or almonds. Am holding now at 120#. It seems impossible to gain weight beyond 120#. yes, it's frustrating, but I prefer a healthy cardio system! Thanks to all who wrote re: plant strong, no oil diet stating they feel great but lost too much weight, (like me). Seems to me it is more important for me to feel great than to be 10 pounds heavier! I'll stick with the diet. I've been on it about 11 months and enjoy the foods now. 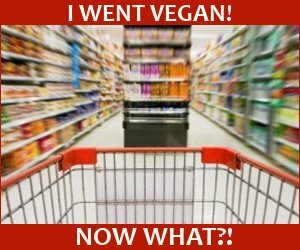 It took awhile but I have NO desire to return to oil and meats and dairy! My husband is now on this diet, also. Thanks, Sassy and Jeff for your fantastic classes! Thanks for everyone's tips on the no oil, vegan, plant based diet. I was feeling depressed because my husband is now on this diet, self imposed for cardiac reasons, and I have always loved cooking, mostly Mediterranean and healthy recipes. Giving up olive oil and fish, nuts and avocadoes is tough. I am encouraged by the comments in this page. Thank you! I have been on a no oil vegan diet for 6 months due to cardiac health issues. The longer I do it the easier it gets. Foods made with oil or sugar are too rich and not enjoyable anymore. I've seen a dramatic reduction in statin use and an improvement in my orthopedic and general health. Dr McDougall's web site also has lots of useful information on the subject. Hang in there, you "newbies" it's worth it! I'll chip in my 2-cents worth. I went vegan three years ago because I decided I wanted to stop supporting the inhumane way animals are raised and slaughtered in this country... if there was a way to feed myself without causing suffering, I couldn't justify creating a need to kill animals to put on my plate. I'd been a egg-milk vegetarian for ten years prior, but I also couldn't live with the way chickens and cows are treated even though they aren't immediately slaughtered. Once I made that decision, I had to figure out how to eat that way. As I looked around I noticed that Bill Clinton and Al Sharpton had lost a ton of weight and looked healthy. Whatever one thinks about their politics, they'd gotten great results on whole-food vegan diets. A year before I went vegan, my new family doctor suggested my going vegan when she discovered I was a vegetarian. Turns out, I'd had a massive heart attack two years earlier and whole-food, no salt-oil-sugar (no SOS) eating has been clinically proven to not only arrest cardiovascular disease, but reverse it. No drug ever been able to make that claim. Turns out that I'm a scientist/engineer who also loves to cook and so I view cooking without SOS as a puzzle/challenge. Today, I've dropped all but a minimal dose of ACE inhibitor and 1/4 of aspirin. I've dropped over 75 lbs, my cholesterol is under 150, my LDL runs under 90, and my BP runs 115/75. My cooking is so good, that I cook a full buffet no-SOS meal for 80-100 people and they come back for seconds and clean the trays. It can be done, not that difficultly, and the health results are definitely worth it! I have been on the no oil diet for 6 months now. I have figured out how to cook without oil and am mostly enjoying the tastes of the things I cook. I am always looking for new techniques to achieve the taste results I and my husband like. My health has improved greatly so I really want and need to stay with this eating lifestyle. the problem is Salad dressings particularly. Although I am more used to vinegar tastes now than I ever was before, with all the dressing recipes I've tried on the internet, I cannot find salad dressing that appeal to me. It was always my solution when having to eat out with family or friends to order a salad, no cheese, no croutons, etc. and bring my own dressing and I end up choking the salad down, but not enjoying it. I really need a solution here. Anyone have a miracle dressing that had great flavor, and not oil or salt? Have you tried making salad dressings with xanthum gum? Here are a couple recipes to try. They're yummy. I realize you want salt-free as well so just leave it out. Maybe increase the other herbs/spices. A general principle I've found that works for a lot of recipes is to substitute cannellini / great-northern bean purée for oil in a dressing. This produces a creamy style dressing. Below is a link to a good collection of no-oil salad dressings. My family's favorite is the Maple-Mustard Dressing. I'll freely admit that many of these dressings either don't worry about minimizing salt or fudge by using "liquid aminos". Braggs plays games with the sodium content in it's Liquid Aminos by reducing the serving size. I tend to use reduced Kikoman soy sauce and just use less than the recipe calls for. I've noticed lots of comments about not being able to find a good oil free dressing and want to share this! Roasted red pepper dressing is so delish! Just roast 2-3 red peppers with no oil in a 375 degree oven for about 30-45 minutes, throw them in a blender with a splash of the vinegar of your choice (I like a white balsamic). This salad dressing is my go to favorite and so easy! I can understand the no oil diet/lifestyle, even though I'm not there yet. I'm not sure I will try the no oil lifestyle, but I want to know why no nuts/avocados while eating a whole foods plant based diet? That just doesn't make sense, and it sounds a bit extreme to me!?! I would appreciate someone's input. Thank you, in advance! I used your no-oil method for roasting radishes and they came out great! Thank you! As someone who's passed the 5-yr mark eating whole-food, Salt-Oil-Sugar (SOS) free vegan, I'll share my thoughts on why one would choose to eat this way. First, I went vegan because of my concern for the animals who are being horribly mistreated to produce even milk, cheese, eggs. As I investigated how to eat vegan, I discovered that SOS-free, Whole-food is an incredibly healthy way to eat. As a survivor of a massive heart attack, I bumped into the writing of Caldwell Essylsten and Dean Ornish who both have been able to REVERSE blocked arteries through this way of eating. Many industries have an interest in keeping us eating the highly processed foods they sell. Oil, even olive oil which is marketed as healthy, inflames the arteries which is the first step in the body sending cholesterol to the inflammation trying to bandage off the inflammation. After years of this irritation, the plaques can either choke off the artery or rupture their pus filled contents into the blood stream which results in the heart attack. That's what happened to me. Another reason to avoid oil is that it is calorically dense and leads to weight gain. Since olive oil is supposed to be healthy, many cooks are very liberal with it. There is science that shows that if the food you eat has no more than 600 Cal / lb, you can eat as much as you want and never gain weight. Oils clock in at 4,000 Cal / lb (that's not a typo) By cutting oil out of my diet, I find that my weight is much more stable and even drifts down if I'm intentional. My friends continue to buy bigger and bigger pants while I keep the same size. The oil producers and ill informed Drs think that you need liquid oil to stay health. Wrong. You do need about 10% of your calories to come from FAT, but is doesn't need to be oil. I get my largest dose of fat from flax seeds which have large amounts of omega-3 (healthy) instead of omega-6 (unhealthy). A final reason to eat this way now is that I've eaten this way for so long now, that food prepared conventionally is heavy, greasy and doesn't taste good to me any more. The oil literally coats the tongue and blocks the flavor of the food I eat from getting to my taste buds. In the early days, I did yearn for butter and oil, but as time went on, I've come to appreciate the good taste of the food I now eat without oil and appreciate knowing that its a wonderfully healthy way to feed my body.